Enable the device's internet connection through your home or office wireless (Wi-Fi) or wired (Ethernet) network. Attach to your device the AWS-provisioned security certificate as discussed in Register Your AWS DeepLens Device. Set up login access to the device, including with an SSH connection or a wired connection. Optionally, download the streaming certificate from the device to enable viewing project video output in a supported browser. 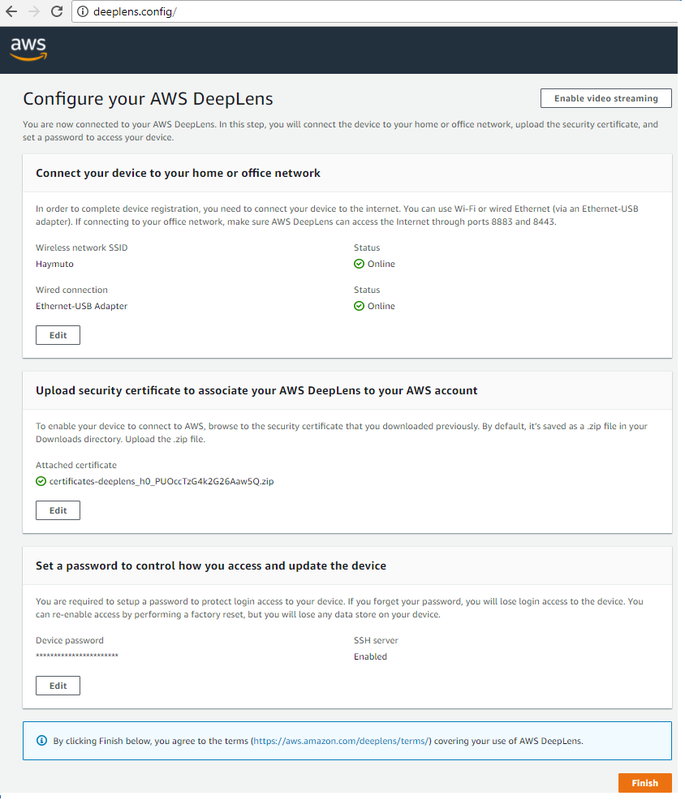 If your computer is no longer a member of the AMDC-NNNN network because your AWS DeepLens device has exited setup mode, follow the instructions in Connect to Your AWS DeepLens Device's Wi-Fi Network to establish a connection and to open the device setup page, again, before proceeding further. 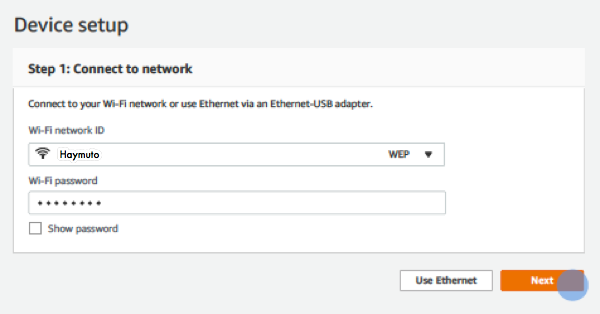 Alternatively, You can choose Use Ethernet to connect your AWS DeepLens device to the internet. Choose Next to connect the device to the internet. On the next page, Choose Install and reboot to install the latest software on the device and to restart the device. After the software update is installed and the device restarted, reconnect your computer to your device's AMDC-NNNN network, navigate to http://deeplens.config in a web browser to open the updated device setup application, and to complete the rest of the device setup as shown in Step 2. The Connect your device to your home or office network section shows the device's internet connection status as Online. You can choose Edit to update the internet connection by choosing a different Wi-Fi network or a wired network with a micro-USB-to-Ethernet adaptor. Otherwise, continue to the next step to complete the rest of the device configuration. Choose Browse to open a file picker. Choose Upload zip file to attach the certificate to the device. The downloaded security certificate for the device is a .zip file. Upload the unzipped certificate file as-is. For device setup update after the initial registration, your device has a previous certificate installed. In this case, choose Edit and follow the instructions above in this step to upload the new certificate. Under Set a password to control how you access and update the device, complete the following steps to configure device access. For the initial registration, type a password in Create a password. The password must be at minimum eight characters long and contain at least one number, an uppercase letter, and a special character (e.g., '*', '&', '#', '$', '%', '@', or '!'). You need this password to log in to your device either using an SSH connection (if enabled below) or using a hardwired monitor, a USB mouse and/or a USB keyboard. For SSH server, choose Enable or Disable. If enabled, SSH allows you to log in to your device using an SSH terminal on your Mac or Linux computer or using PuTTY or another SSH client on your Windows computer. For subsequent configuration updates after the initial registration, you can choose Edit and follow the ensuing instructions to update the password. Optionally, on the upper-right corner of the device setup page, choose Enable video streaming to enable viewing project video output using a supported browser. For the initial registration, we recommend that you skip this option and enable it later when updating the device configuration after you've become more familiar with AWS DeepLens. Review the settings. Then, choose Finish to complete setting up the device and to terminate your connection to the device's Wi-Fi network. Make sure to connect your computer back to your home or office network. To ensure the setup completes successfully, make sure that AWS DeepLens device has access to ports 8883 and 8443 and is not blocked by your network firewall policy. If the AWS DeepLens device's connection to the internet repeated turns on and off after you chose Finish, restart your home or office Wi-Fi network. This completes the device registration. Verify your device registration status before moving on to create and deploy a project to your AWS DeepLens device.